count Number of samples during the period. min Minimum value during the period. max Maximum value during the period. sum Sum of values during the period. avg Average value during the period. percentile_50 Percentile(N) is a number which is greater than the N percentage of samples in the period. For example, percentile_995 (99.5%) represents a number greater than 99.5% of all observations received during the period. The remaining 0.5% of all observations are greater than percentile_995. Percentile argument can be any number between 0 and 100, for example: percentile_25. The NIST (National Institute of Standards and Technology) method is used to calculate percentiles. standard_deviation Standard deviation of values during the period, square root of the variance. first First value received during the period. last Last value received during the period. delta Delta is computed as the difference between the last value in the period and the last value in the previous period. If no last value is present in the previous period, then delta is calculated as the difference between the last and first values during the current period. See also counter aggregator. wtavg An average resulting from the multiplication of each component by a factor reflecting its importance. 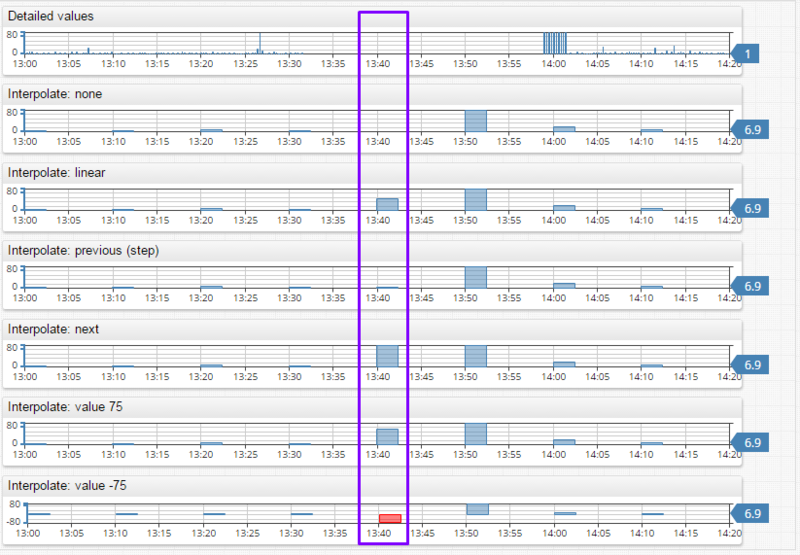 Weight is assigned based on timestamps rather than index. Data points with older timestamps contribute significantly less to the weighted mean than data points with more recent timestamps. The weight of a sample is proportional to the current_time – first_time + 1 (in seconds), where current_time is the timestamp of the sample, and first_time is the timestamp of the first sample received during the period. The weights are normalized so that their sum is equal to 1.
wavg A weighted average of samples received during the period. The weight of a sample is proportional to the index of the sample in the time-ordered array of all samples during the period. A weighted average is sum of the sample’s values multiplied by their weights. See a calculation example below. min_value_time Time when the minimum value (min) occurred during the period. max_value_time Time when the maximum value (max) occurred during the period. threshold_count Number of threshold violations during the period. A violation is a sequence of one or more successive data points exceeding the specified threshold. If the threshold is set to 4, then one sequence (5,7) exceeds the threshold. threshold_duration Total duration of threshold violations during the period, in milliseconds. If the threshold is set to 4, then one sequence (5,7) exceeded the threshold and its total duration based on linear interpolation is 550 seconds. If the threshold is 5, then duration is 850 seconds. For periods at the beginning of the timespan, at the end of the timespan or after a missing period, the value at the beginning of the period is set to the first value, and the value at the end of the period is set to last value. threshold_percent Percent of time during which the value was below threshold (no violation). If the period doesn’t contain any detailed values, it will not be included in the results. Aggregator behavior can be modified by specifying an interpolation function. NONE (default) No interpolation. Periods without any raw values are excluded from results. LINEAR Calculate period value using linear interpolation between previous and next period values. 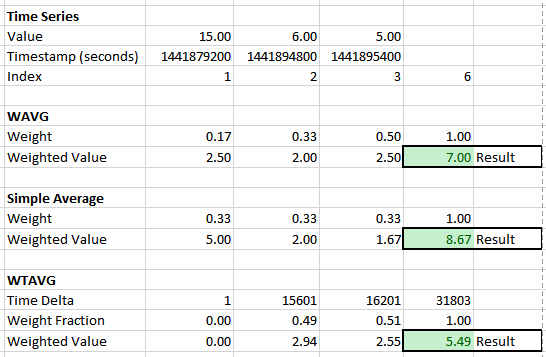 PREVIOUS Set value for the period based on the previous period’s value. NEXT Set value for the period based on the next period’s value. VALUE Set value for the period to a specific number. Download the excel spreadsheet for testing and calculations. wtavg() – weighted time average. Period is set to 11 hours, so it includes with whole data set. NOTE: Period starttime is inclusive and endtime is exclusive. Meaning that startime = 2015-09-14 10:00:00 will include data points that occurred exactly at 10:00:00 and later. Endtime = 2015-09-14 11:00:00 will include data points that occurred up to 10:59:59, excluding points that occurred at 11:00:00 and later.